It might not seem immediately obvious, but how you utilize your office space can have a direct and observable impact on your business’ revenue. Make sure that you are maximizing your office space and keep everything on site you really need to run and grow your business – this may really save you money. And as for what you don’t need readily on-hand, there are a variety of storage options to suit all your needs. 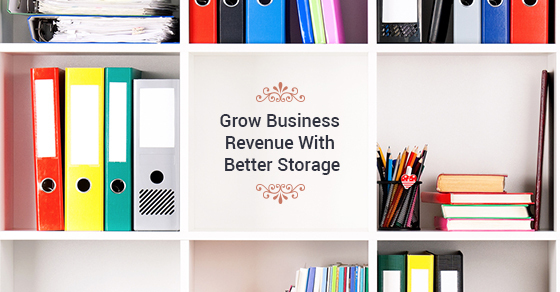 Here are five ways that renting storage space can help your business’ revenue and cut costs. Remove the clutter. Most offices are filled with an array of desks, cabinets and paperwork supplies that are just not needed. Anything that doesn’t need to be on site: put into self-storage. It frees up space not only for items and furniture that you are actually using, but will make your employees feel less boxed-in and hopefully more productive. Buy in bulk. Without sufficient storage, you may be purchasing business supplies in small amounts to keep your office space from getting overloaded, but this may be preventing you from taking advantage of great deals and lower prices. Buying items in bulk can be a big money saver, and you shouldn’t be forced to choose between a good deal and a comfortable and uncluttered office. Added security. Most self-storage facilities have sophisticated security systems installed for round the clock surveillance. Most businesses have sensitive documentation and client information that needs protecting, as well as expensive raw materials. The added peace of mind not only for you, but individuals and other companies doing business with you, can help build relationships and establish your name as one that is synonymous with safety and security. Good alternatives to warehouse fees. If your business deals with a product that has a high turnover, ordering, purchasing and storing is a never ending task and usually entails the renting out of warehouse space. Self-storage, especially for mid-sized companies can be a viable, more cost-effective alternative to warehouse storage which still allows you to store items off premises and frees up space. Run your Business From the Unit. It may seem unconventional, but according to research done by the BBC, many small firms choose to operate out of self-storage units because of the flexibility, short notice periods, low overhead and the ability to come and go as one pleases. Finding self-storage that suits your business is essential for keeping an uncluttered office space and can even be a great substitute for traditional warehouse space. Effective and smart storage is one of the easiest ways to save your business time and money, and it also provides assurance that there is a third party, with significant security measures in place, keeping an eye on your business’ valuables.